Wait a minute! Did I just say poems to see? Yes. 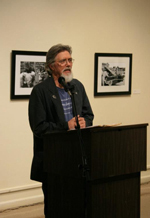 Glenn Miley from Sherrill, NY is one of the best visual poets in the world. Glenn is a farmer who raises poems along with crops. His poems are funny, homespun, and far reaching. Glenn is one of many who show up for these acrobatic poetic events. Poets come from Camillus, Baldwinsville, Skaneateles, Rochester, Ithaca, Weedsport and of course good old Auburn. It’s a fun time. It’s free. Refreshments are served. On Friday, April 19th, 2013, the Schweinfurth Art Center will open its doors at 6:30 PM for people to meander around to enjoy the art show. Then the readings will take place from 7-9 PM. Jim Delaney is the Master of Ceremonies—he always opens up the evening with his self-effacing poems and some prose from his recently released book, Hogarth&apos;s Reign of Terror (The Hogarth Saga). The poetry that is shared is from a wide array of people who totally enjoy the written word, who love to listen to the music of language, who enjoy being transported across eons, into neighborhoods, under beds, over obstacles, and through the minds of artists. The evening is a wonderful time to visit with people from Central New York, those who enjoy art, culture, humor, and Jim’s famous guacamole dip.